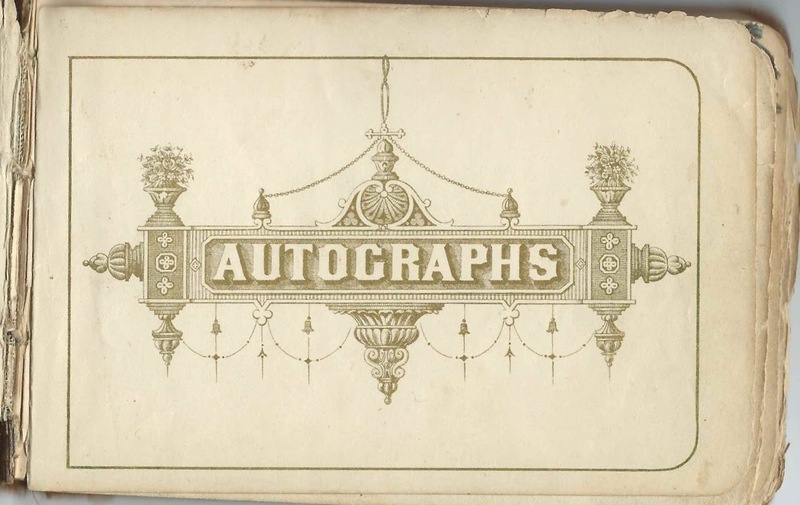 1883-1885 autograph album of Miss Sarah Boerr of Grand Rapids, Michigan. 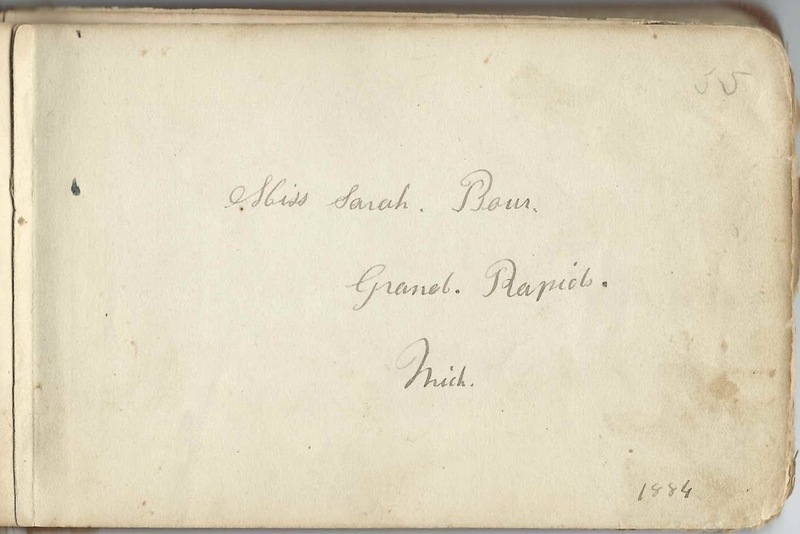 Records of her family give variant spellings of their surname: Boer, Borr, Bor. 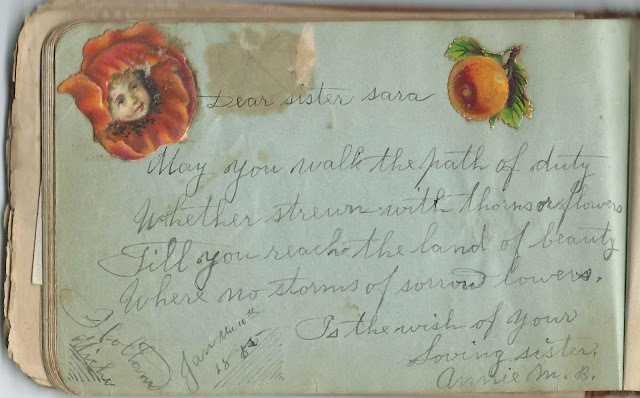 The album measures approximately 6-1/4" x 4" and contains the sentiments of nearly 60 of Sarah's relatives, friends and schoolmates. It also contains a letter concerning the upcoming funeral of Peter Boomker, who was killed in 1923 as the result of a fall at work. Sarah had married into the Boomker family. Sarah Boerr/Boer/Borr/Bor was born March 9, 1862 at Zeeland, Michigan, the daughter of Hendrik Bor and Bastiannje (Leenheer) Bor. Presumably Hendrik had an earlier family in the Netherlands; whether Sarah ever had contact with her half-siblings I don't know. She had, I believe, at least five full siblings, some of whom or whose spouses inscribed pages in her album. Sarah's oldest sister, Johanna H. (Borr) Van Eyk and her husband Ryk Van Eyk signed pages in the album, Johanna at Holland, Michigan, on March 18, 1885, and Ryk on March 20, 1885. Sarah's sister Alberdina "Delia" Borr inscribed a page on December 19, 1883, before her marriage to John Mulder (Mueller) in 1889. 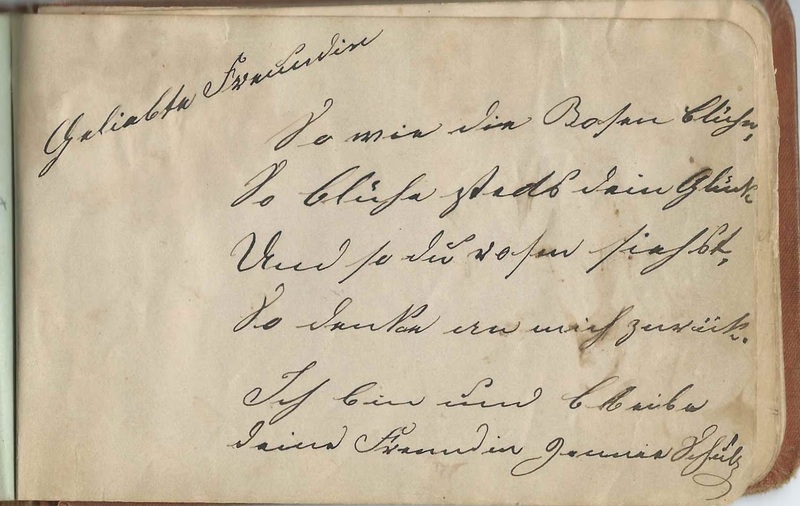 Sarah's sister Annie Marie Borr signed a page on January 10, 1885, before her marriage to John Hieftje in 1889. 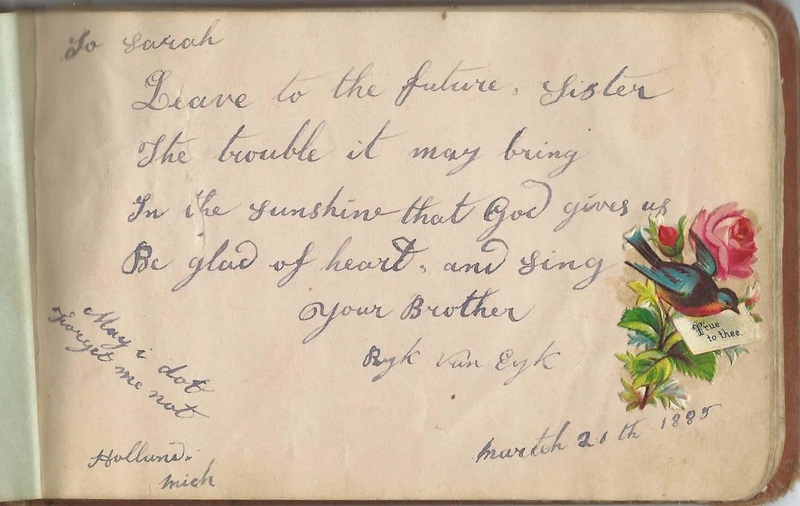 The "loving sister Gertie" who inscribed a page may have been Grietje (Van Dyke) Bor, wife of Sarah's brother Pieter Bor. I believe that the J. Meulendyk who signed a page at Ebenezer Parsonage on April 16, 1884 was Sarah's pastor. About 1888 Sarah married Johannes Jacobus Boomker, "John", son of Jan Wolters Boomker and Grietje Johannes (van der Molen) Boomker. John was born in the Netherlands about 1863 and came to the United States when he was a young child. As noted above, he was related to Peter Boomker who died in a construction accident in 1923 and whose funeral was the subject of a letter found tucked in the album. John and Sarah moved to Chicago and raised, I believe, seven children. John died in 1922, and Sarah in 1936. Jennie, signed at Grand Rapids, Michian, in September 189x or 188x. Surname could be boonfird or ? Avan Sull or Snell, signed at Grand Rapids, Michigan, on "4/2/84". Not sure of either give name or surname. Miss Sarah Boerr of Grand Rapids, Michigan, 1884; album owner. Her surname also appears in records as Bor, Boer and Borr. 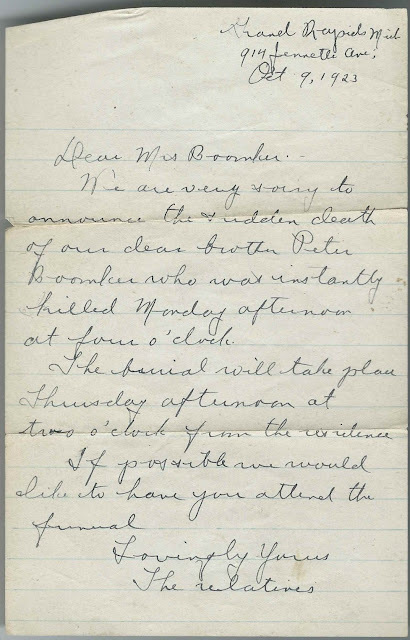 Peter Boomker; 1923 letter written to inform relatives of his funeral; he was killed in a fall while on the job. 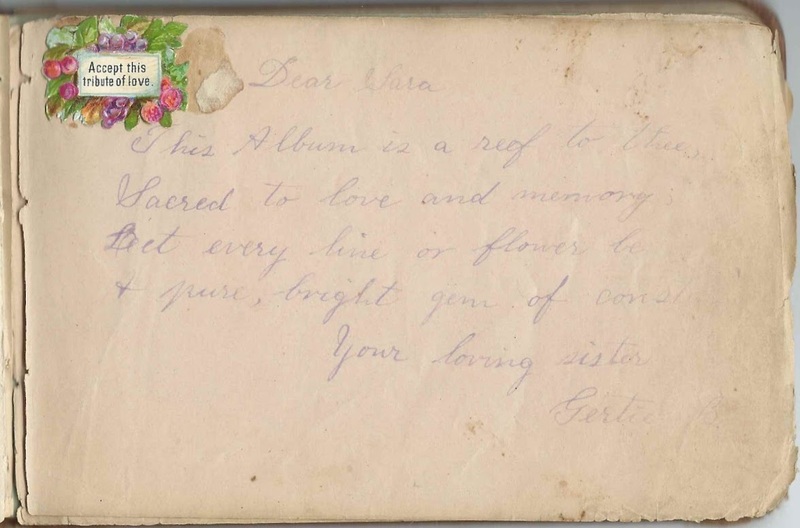 "Your loving sister Gertie". Presumably Grietje (Van Dyke) Bor, wife of Sarah's brother Pieter Bor. Delia B., "Your True Sister", signed at Grand Haven, on December 19, 1883. She was Sarah's sister, Alberdina "Delia" Borr, who would marry John H. Mulder [Muller]. "Loving sister" Annie M. B., signed on January 10, 1885 at Holland, Michigan. Sarah's sister Anna Maria Borr. Henry DeWitt of Fillmore, Michigan, signed on April 18, 1886. Gerrit Heuvelhorst, signed on March 31, 1883 at Grand Rapids, Michigan. Trui Heuvelhorst of Grand Rapids, Michigan, signed on March 31, 1883; not sure of given name. James Hoogens; could he be James Hoogenstyn? James Hoogenstyn, 1000 Stateland Ave.
A. Johnsen; middle initial might be U or Y or ? Written upside down: Jennie Leeuw, signed at Grand Rapids, Michigan, on March 13, 1883; page written mostly in Dutch. 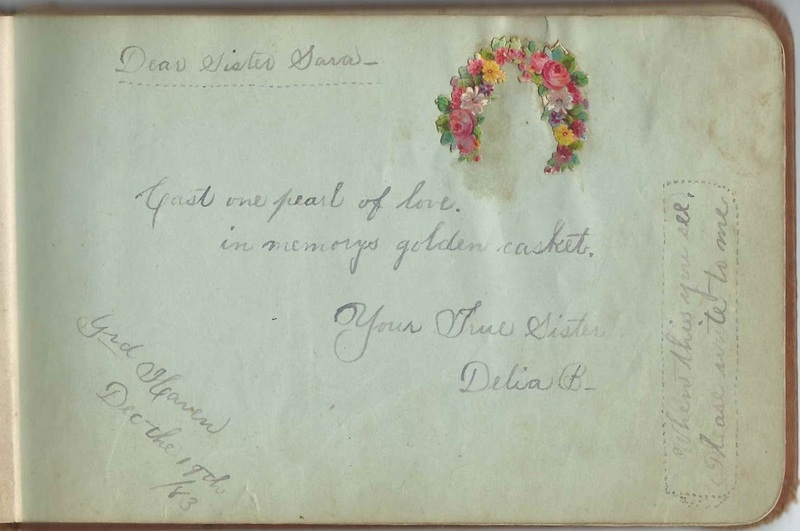 Hattie Meengs, signed at Grand Rapids, Michigan, on February 25, 1884. 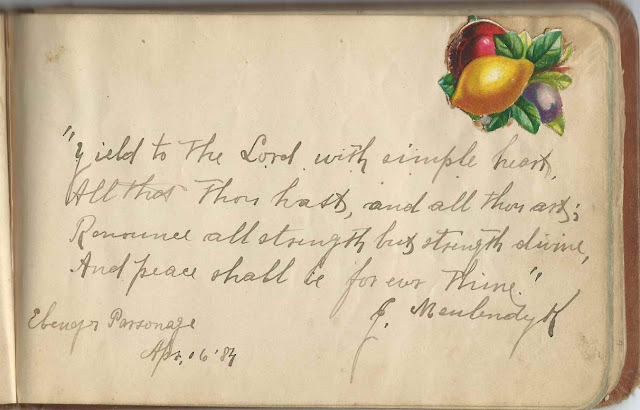 J. Meulendyk, signed at Ebenezer Parsonage on April 16, 1884. Presumably Sarah's minister. Joseph H. Poisson, signed on June 3, 1885 at Grand Rapids, Michigan. S. W. Simcox, signed on June 30, 1884. Presumably Stoughton W. Simcox.
? 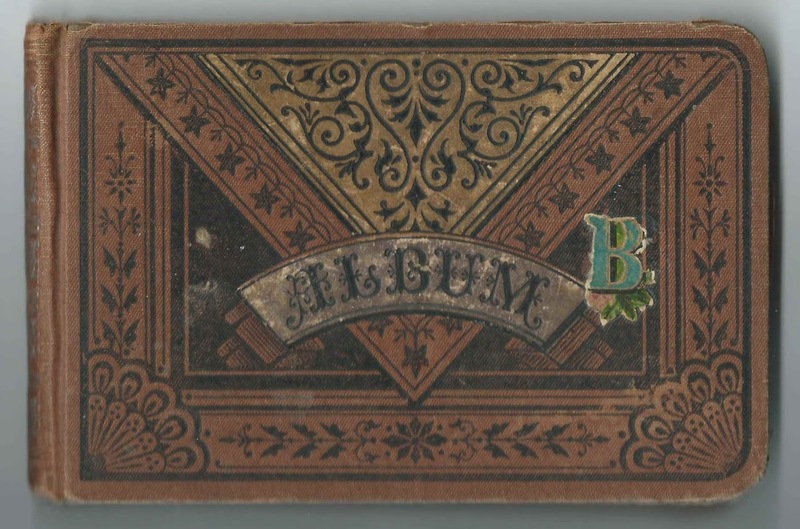 Van Dyk, signed at Zeeland, Michigan, on January 11, 1885. Initials might be A. C.
Johanna, Mrs. Van Eyk, signed at Holland, Michigan, on March 18, 1885 [or 1888]. 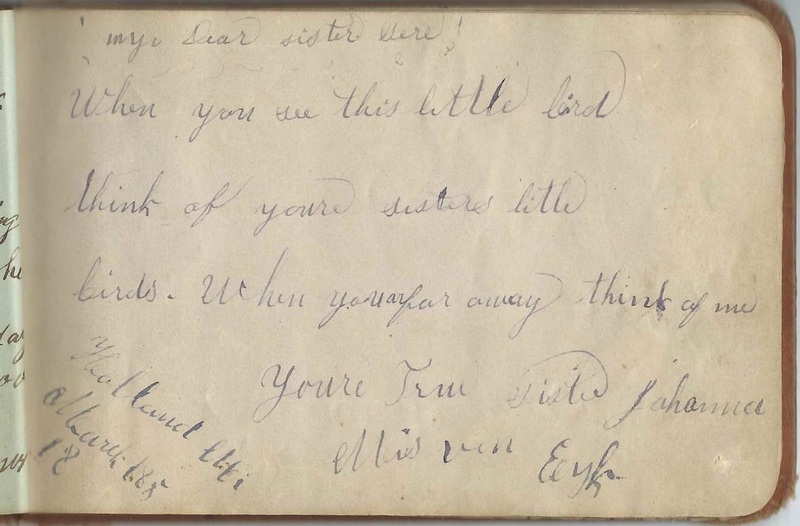 "Your True Sister". She was Sarah's sister Johanna Hendriks (Borr) Van Eyk, wife of Ryk Van Eyk. Frederic L. Vierheilig of Grand Rapids, Michigan, signed on January 27, 1884. Presumably Frederic Lewis Vierheilig.